The line between fiction and memoir can be a tricky one. Memories are unreliable, perspectives inevitably partial. We create narratives of our past, assign meanings and interpretations, but the truth of it all is open to challenge and our truth may not be that of others who were there. Rashomon remains one of my favourite films. 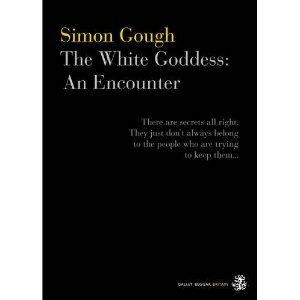 The White Goddess: An Encounter is a novel by Simon Gough about, in part, his relationship with his great-uncle Robert Graves. It is, Gough says in a foreword, true in the sense that it captures the truth of what happened between them, possibly untrue in terms of precise chronology or incident. It is history then that has been turned into myth, and that’s something that I think Graves would have approved of. In 1989 Simon Gough is a dealer in second hand and antique books. He’s been given five years to live, and he’s been invited back to Deya, in Majorca. Simon hasn’t been to Deya for nearly thirty years, not since, well, to say not since what would be giving far too much away for those who don’t already know Graves’ story. I quoted that becauseI liked how much implicit context it carries. Immediately it’s obvious that Simon’s relationship with his mother is a difficult one. Simon is constantly afraid of her moods, of upsetting her or triggering her anger. It’s not that his mother’s abusive, but she is raising Simon on her own and she is deeply temperamental. He is a lightning rod for her fears and anxieties. Deya though holds more than Simon’s mother and a bit of relaxation. It holds his great-uncle (grand-uncle, as Graves instructs Simon, “Great is for steamships and railway lines, don’t you think? Grand is for fathers and uncles, and Russian dukes, of course!”). Simon’s existence until now has been grey and painful, but Graves is a vast charismatic explosion of a man filled with life and passion and sheer vital force. He dazzles. The White Goddess is a slow burner of a book. The first 100 pages or so didn’t particularly grab me (it’s over 600 in total). It’s not really until after around page 140 or so it really kicks into gear (Part 1 ends on page 140). Gough spends a huge amount of time painstakingly setting up his characters, his locations, ensuring that the reader can see Deya as he saw it, that they know Graves and his family and his various hangers on. That early part of the book is made more difficult by a couple of annoying stylistic tics that Gough has as a writer. He vastly overuses italics in quoted speech. This quietens down later on but in the first 100 pages or so there’s scarcely a sentence without some italics in it telling the reader where to place the emphasis. Gough wants you to know how these people spoke, this is an act of memory after all, but I found it bludgeoning. Similarly annoying is how characters rarely in fact do speak. Instead they grin, they gasp, they explain. Grin is actually a particular favourite. Characters grin, grinned, are grinning. Gough is planning a sequel, which I plan to read, but his editors should strike that word whenever he uses it going forward. With all those problems why would I read the sequel? Because once the book gets going it turn’s out there’s a point to all that scene-setting. Part 1 is critical because when Simon returns in Part 2, in 1960 aged 17, you feel why this place is so important to him. You understand why Graves is so important. Sometimes a book needs a little patience, a small act of faith on the part of the reader, and this is one of those times. ‘I don’t mean Uncle Robert – he’s remarkable, although how he can work in this climate defeats me – and surrounded by all these so-called writers and artists who never sell a word or a picture and live off private incomes and drink themselves into a stupor every night. In that one little exchange everything we’ve seen of Deya is transformed. Again, that wouldn’t work without the slow buildup. The heart of the novel comes when Simon returns, in order to attend university in Madrid. That’s when he meets Graves’ muse, Margot Callas. Margot is young (though older than Simon), beautiful, effortlessly herself. To Graves she is an incarnation of the Goddess, a mythic intrusion into reality which fuels his poetry, and he sees himself first and foremost as a poet. Graves cannot write poetry without a muse, for him poetry is both divine gift and act of worship. If Margot were to leave she would not just be taking herself away, she would be taking his art, and destroying her own purpose. Simon, of course, immediately falls in love with Margot, but then who doesn’t? A core theme of Anthony Powell’s A Dance to the Music of Time was the creation of personal myth, a myth of self that could guide one’s own life and that somehow through one’s own belief in it could become true. Graves lives steeped in myth, he wrote a book titled The White Goddess which delved deeply into the relationship between supposed-ancient Celtic belief and poetry. He sees himself as a mythic figure, the Poet with capital P inspired by the Goddess with capital G.
Graves’ force of personality is so strong that his myth sweeps up those around him, particularly the young and impressionable, like Simon. He talks of how at Deya there are no secrets, but that is just another part of his myth. Graves has no secrets, everyone else does being merely mortal. Graves is a classicist, and so his myth is classical drawing more on the traditions of Greek tragedy than the Christian arc of fall and redemption. It is the Poet’s destiny to have the Goddess withdraw her favour, to be usurped by the False Poet. This is a haunted novel. Haunted primarily by Graves of course, who by 1989 is dead and yet still a lowering presence. Not just by Graves though. In 1953 Simon is part of a play put on for his birthday in a grotto in Deya. When practising there he feels presences, spirits, what Graves believes are ghosts of people yet to be. Myth lends meaning to landscape, not perhaps in a way that is true but in a way that is nonetheless meaningful. Were there ghosts in Deya? I don’t believe in ghosts, so I don’t believe so. Does myth have power though? Undoubtedly. Gough is often at his best when capturing how fragments of places survive, in our memories and imaginations but also in occasional remnant pockets which preserve what was before. When Simon returns in 1960 what was once rocks and scrub is showing signs of nascent development. Just a few houses and a restaurant so far, but the signs are there of what will follow. By 1989 Majorca will be transformed. What was though remains, sleeping until we awake it by our acts of recognition. This is, ultimately, a compassionate novel. Simon’s mother may seem the villain to him at ten, but later their relationship improves and he understands her better. Graves is impossible, his attitude to Margot possessive and suffocating (and denying her her own agency in favour of her significance within his myth), but he is also funny and brilliant and it is easy to see why he was loved. Margot is perhaps selfish, but what woman can live up to being a goddess? And of course there is Simon himself, miserable at ten and conflicted at 17, pulled between Graves and Margot neither of whom should ever have asked as much of him as they did. The White Goddess is also a peculiarly unfashionable sort of novel. It is written as if from an earlier age, as if Maugham were still a leading writer and Greene cutting edge. It is an old man’s novel, which sounds dismissive but isn’t. It is concerned with telling what happened, long ago, truthfully if not always with precise accuracy. It is concerned with being fair, which must be difficult when one of those the author most needs to be fair to is his earlier self. It is emotional, but not sentimental, and it is kind which is no small thing. Often I read reviews on blogs of books that form part of a series, and the blogger praises the book but when asked if they will read the sequel is uncertain. If the book is so good why wouldn’t you? The White Goddess is flawed. Gough has some stylistic habits that he should break, that do get in the way, but his story is a fascinating one and over the course of his narrative he does bring back places and people long past and brings us into their w0rld. All these words and I’ve not spoken of Gough’s evocation of Franco’s Madrid, of his sympathetic portrait of Graves’ wife, Beryl, or his wild cousin Juan. This is a rich book that ultimately merits its length, provided you’re able to take that leap of faith with the first 100 pages or so. I received my copy of The White Goddess as a free review copy from the publisher. Would you read the sequel, Max? I see that this is available as a kindle version in N. America and no hard copy available here. I sent myself a sample as this sounds like something I’d enjoy (even though I know the repeated ‘grin’ will grate on me.) I suppose I am particularly drawn to the long-distant relative who becomes a turning point in life as I experienced something along the same lines with my grandparents who were not glamourous people and who did not live a glamourous life but who, were, nonetheless, formative for me. Plus this also keys into the recent Gazdanov novel I read in which the narrator’s uncle tells him that how he views incidents will shift as time goes by and so never to become a man of conviction as conclusions we draw are ever-changing. I get that message from the review too. Thank you Max. I’m sure everyone will know how much this thoughtful review pleased me as the publisher. Happily, the other galleybeggars have informed me that some have actually been removed between the proof and the final version. Anyway, delighted you want the sequel! We’re hoping to help bring it into the world before too long… Although of course, everyone has to run out and buy the first book to enable that to happen! I will Guy. Given it’s size I’d say a kindle version is the better bet actually. It’s a bit hefty otherwise in purely physical terms. Curiously I found parallels with my own childhood in places, although mine was as far from Gough’s as one could imagine. Still, the situation may vary but emotions are often universal. That Gazdanov you reviewed sounds excellent. Shame he’s out of print. Sam, thanks for sending me a copy. As I said to another blogger recently, there may be good reasons for each stylistic choice but that doesn’t make them right. There is though a danger too in focusing too much on the negatives. I gave the novel a bit of a kicking where I thought it deserved it, but only because I thought it good enough to merit my doing so. Given the reviews you’re getting I’d hope you’d get some sales, though it’s clearly very much a minority interest book. Still, I think there’s an audience out there for it and I hope it finds them. I found this review exciting because I’m a devotee of Robert Graves, although I don’t know as much about him as I should, so I really should read this book you reviewed, or at least get myself a good biography. I went to great lengths to acquire permission from Graves’ publishers to use copyrighted poems of his as chapter epigraphs in my novel The Termite Queen. I simply couldn’t publish that book without using his poetry. My novel ended (strangely enough) with a theme I didn’t originally intend – namely, that of atonement and absolution – and so I found myself quoting early poems of Graves that carry Christian implications. The final chapter uses a piece of the very first poem in his Collected Works (“In the Wilderness”) because of the scapegoat reference, but several other epigraphs reflecting more classical myths absolutelly fit their chapters (especially “The Jackals’ Address to Isis,” about a woman wailing over her dead love; and “Intercession in Late October,” for a chapter where someone dies, with the wonderful lines, “Spare him a little longer, Crone, / for his clean hands and love-submissive heart.”) Furthermore, the principal source that I used for my retelling of myth in “The Labors of Ki’shto’ba Huge-Head” series is Robert Graves’ Greek Myths. When you write, “I don’t believe in ghosts, so I don’t believe so. Does myth have power though? Undoubtedly.” – you’re exactly reflecting my own views – it’s why I write the way I do. If you’re a devotee of Graves you absolutely should read this. It’s a very intimate portrait. Affectionate, but not blindly so. Interesting how you’ve used him in your own fiction. I wasn’t familiar with his poetry before this (though I’ve read his I, Claudius and his Claudius the God, and own his Count Belisarius). It’s good that he’s still inspiring. Myth, and mythic truth which is both true and yet not factual, is I think hugely powerful and important. I should have brought that out more, because one of the finest parts of this novel is the realisation of myth and how Graves’ myth comes to distort the world around him. Of course, I could always be wrong about the ghosts (actually, I’d love to be wrong about the ghosts, I just haven’t come across anything to persuade me I am). Regarding your question, Graves seems to perceive poetry as an inherently male activity. The female role is as conduit for the Goddess, as muse in other words, inspiration and subject but not creator. Perhaps he conceived though that a woman could be a true poet, but if so she would become a vehicle I think for the White Goddess, not for the god if he believed in such a thing. Graves can though be great, inspired, and yet profoundly wrong on some matters. Indeed if anything that’s pretty much what this book shows.He was born in 1895, perhaps it’s not surprising that some of his views may have been by our standards problematic. Given you publish on kindle I imagine you have one, so you could pick this up for that. What’s his Greek Myths like? I think Graves’ Greek Myths is essential for anyone seriously interested in the myths. In my undergraduate days I worked in my college library (I later became a professional librarian) and the head librarian was Ellsworth Mason, who also taught an occasional English class. He was a Joyce scholar, but he was also temendously interested in Robert Graves. He acquired for the library everything Graves ever wrote, and it was on his recommendation that I bought The Greek Myths (I’m still using that same copy, which is falling apart. I would buy a new one, but it would lack all my annotations!) Graves covers every possible version of every myth, and he backs it all up with copious source notes, so if you want to consult the original texts in Greek or Latin, it’s all there. Graves’ biases are abundantly evident (he stresses the death-of-the-twin myth – how one twin is killed at the winter solstice and the other twin replaces him, and he emphasizes the prevalence of goddess worship in the early days and its replacement by the coming of Zeus worship). But you can learn just about anything you want about all the variants of the myths from this book. It’s not a popularized or fictionalized account, and it’s a bit difficult to use, but it’s definitely a must-have! Actually, I just went in and bought the Gough book on Kindle! And no, I didn’t know Graves wrote some literary science fiction! I’ll have to look into that, too! I have to confess I’ve read only two of Graves’ novels (not the Claudius books, which I really should read). I’ve read Hercules My Shipmate and also Homer’s Daughter, which is a retelling of the Nausicaa segment of the Odyssey. The premise is that the author of the Odyssey was not Homer the old, blind bard, but a young Sicilian girl named Nausicaa. It’s really gory and violent and would make a good TV movie! It’s also surprisingly feminist in its premise! Thanks! And no hurry! I just appreciate the attention! By the way, my name is Lorinda J. Taylor, if you’re searching me on Amazon. Also, my usual cyber-handle is TermiteWriter, but when I took a new WordPress Gravatar, I ended up with my alternate, TermiteSpeaker. My use of Graves poems as chapter epigraphs is in the 2v. novel, The Termite Queen. Most of the myth applications is in the “Labors” series (I credited Graves’ influence on the back of the t.p. of “Stolen Mother)). I found you on Smashwords. Got a copy of the labors of Kishotoba… Will look out for Graves! PS: The “grin” thing would have irritated me but not as much as italic in sentences. I can’t stand this when I read, there are enough words to emphasise something without using italic. “truthfully if not always with precise accuracy” – a lovely distinction Max. The book sounds dense, and despite the couple of drawbacks you mention, satisfying. Kudos to Sam – I wasn’t aware he was putting his money where his mouth is and actually publishing stuff. Graves is a fascinating figure. I’ve read the Claudius books and was given a bowdlerised version of The Greek Myths as a kid. Goodbye to All That is one of the books jostling at the very top of my TBR pile just now. Some of his ideas do seem extraordinary, which is why grappling with them is so worthwhile. Yeats had similar thoughts about “The Poet With a Capital P” and the mythological apparatus that demanded, although his inspirations were Celtic rather then Greek obviously. Evocations of a lost Europe…family myths…the paradoxical mother figure: I unhesitatingly recommend Sybille Bedford’s novels. I know you’re not short of things to read, but she hits all those marks in her own career “novelising” her remarkable biography. And she has the virtue of being a superb stylist whose books are considerably shorter then 600 pages. The italics thing is a bit of a pet hate of mine. In Gough’s defence, the sorts of people he’s portraying did speak (from my small experience of similar) in quite an affected way, placing very strong stress on parts of their sentences. It is then probably pretty accurate, still annoying though for the reader. I know one of the publishers online, Sam, via the Guardian. He knows I have a blog and asked if I’d take a look. Given the Graves connection I thought it might be interesting, even if it’s not the kind of book I would normally seek out. Leroy, that’s the essence of myth isn’t it? True, but not accurate. Some of his ideas seem frankly mad. The whole White Goddess thing, as depicted here his suffocating attitude to his muses whom he appropriated as existing to fuel his talent. It becomes true though, through force of belief, Margot does fuel his talent and the threat of losing her damages it. Sybille Bedford, the name rings a bell. I’ll check her out. The relationship between the neopagan Triple Goddess and ancient religion is disputed. Ronald Hutton , a scholar of neopaganism, argues that the concept of the triple moon goddess as Maiden, Mother, and Crone, each facet corresponding to a phase of the moon, is a modern creation of Robert Graves, drawing on the work of 19th and 20th century scholars such as especially Jane Harrison ; and also Margaret Murray , James Frazer , the other members of the ” myth and ritual ” school or Cambridge Ritualists , and the occultist and writer Aleister Crowley .